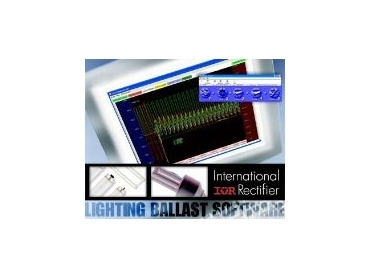 INTERNATIONAL Rectifier(IR) has introduced Version 4.0 of its popular ballast design assistant software. The software, IRPLBDA4, dramatically reduces electronic ballast design time, producing a schematic and complete bill of materials. New features in this version include support for dc input voltage applications and a new time domain graph feature. The new graph feature is based on a simplified numerical analysis technique and shows ballast output waveforms including the half-bridge voltage, lamp voltage and current and resonant inductor and resonant capacitor current. The software generates designs for IR's recently-introduced IR2520D compact fluorescent lamp (CFL) ballast control IC and the IR2161 intelligent control IC for low-voltage halogen lamp transformers in addition to other IR electronic ballast ICs such as the IR2156, IR21571, IR21592, IR2166 and IR2167. The software supports 38 lamp types and seven different ballast configurations. Users can add new lamp types. Over 20 parameters are selectable by the user, including frequency, voltage, current and component values. Universal ac mains voltages are supported, including 80V to 140V and 185V to 265V, with or without power factor correction, 24Vdc. Also included is an inductor calculator that creates winding specifications for the resonant output inductor as well as the power factor correction inductor if used. The software is compatible with Windows XP operating systems.